Loki is the second release of the Valhalla collection, inspired from Scandinavian myths. After Thor and Loki releases, Highland Park completed the collection with Freya and Odin. Loki is the second release of the Valhalla collection, inspired from the Scandinavian mythology. After Thor and Loki releases, Highland Park completed the collection with Freya and Odin. One of the most complex characters of the Nordic mythology, Loki constantly challenges the order and hierarchy of Gods in the Kingdom of Asgard. However, his mischievious actions always lead to the rise of new heroes among the Gods. 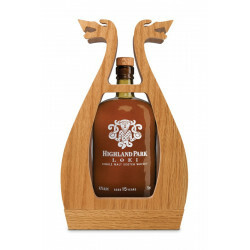 Just like its name, this whisky is unpredictable and impetuous, maybe also referring to the constantly changing weather of the Orkney Islands, where is sited the Highland Park distillery. Quite vibrant and strong, this Single Malt develops a impressive variety of flavours with a great complexity. Nose: a touch of dried bitter orange, slowly evolving onto lemon peels, followed with cardamome and gingerbread. A drop of water reveals liquorice and smoke. Palate: its waxy texture is deepened with intense smoky notes belying the nose, and the illusion of lemon flavours disappear. The smoke allows liquorice and spiced apples to break through. Lemon and grapefruits are also part of this elusive, surprising character. With a dash of water, lingering notes dark chocolate melting over smouldering ember offer a delicate, smoky impression. Finish: Loki has a taste of roasted cloves, smoke and sweet vanilla. A constantly changing spirit, from inhalation to aftertaste.